Our "Playful Paws" Day Camp is the best group play program in Flagstaff! Hundreds of canine companions have switched and/or joined our program (check out the names on our Canine Clubhouse in the group play yard!). We are the only facility in which each staff member is trained and certified through the Dog Gurus, the industry's premier and most knowledgeable organization in "doggie daycare" or off leash group play. Having an external entity certify our staff adds credibility that we truly are professionals! Our Day Camps are different than most facilities. From our formal evaluation requirement to division into up to 32 different play groups to proper play time/rest period ratios...you won't find a healthier group play program elsewhere! At Cinder Hills, our Day Camp provides structured play and learning opportunities. Our play groups are supervised by our fully-trained and certified Pet Care Technicians. Dogs are divided into play groups by size, temperament and play style, creating a safe environment. We consistently maintain the highest staff to dog ratio available in the area. Our play groups NEVER exceed 15 dogs/group. A half day of day camp is considered 5 hours or less. You may drop your dog off at any time and then pick up within the next 5 hours. Our hours of operation are Monday – Friday (7:30am – 6pm) and Saturday – Sunday (7:30am – 5pm). A half day option is $16. Drop-offs prior to 8am require setting up with staff prior to drop-off. When your dog is having a vacation with us and you're away, they can also join in the daily fun with our Playful Paws Day Camp. For our boarders, in addition to the already inclusive one on one playtimes, we offer a daily rate for Day Camp of $6 per day. You must apply for and be accepted into our group play setting. A formal evaluation by a Certified Pet Care Technician is required. There is a $25 evaluation fee for the in depth evaluation as it takes a couple of hours to perform and we have to schedule in evaluator dogs to assist in the process. We want to ensure your family member succeeds in all group interactions, so it is important that multiple aspects of your dog's personality are taken into consideration. We will look at 61 different aspects of your family member's character, personality, temperament, play style, and general demeanor. We utilize "evaluator dogs" in our process so the evaluation needs to be scheduled to ensure we have the evaluator dogs on-site. If your pet's evaluation indicates they are a good fit for Day Camp, then they can stay in Day Camp for the rest of the day at no extra charge. If they show that Day Camp is not a good fit, then we will take them on a Fun in the Forest hike at no additional cost. 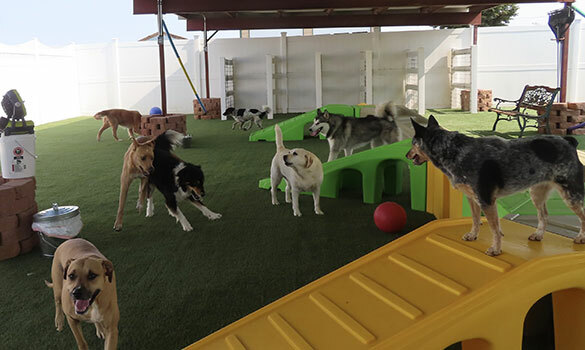 Whereas most doggie daycare centers offer two different play groups (large and small dogs), at Cinder Hills our evaluation process results in up to 32 different play group types! 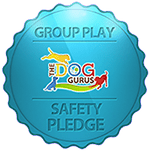 Our play groups are typically smaller than most doggie daycare centers as guest safety is our number one priority. If you will be boarding with us and want your dog evaluated for Day Camp, then this can be done during their stay and does not have to be done prior to coming in. NOTE: You must schedule your dog's evaluation ahead of time (if not boarding) to ensure we have space and evaluator dogs onsite! We do not "crowd in" dogs into our play groups! Currently, we do not conduct evaluations on Sundays due to the scheduling of evaluator dogs. Dogs who do not attend day camp at least every 90 days must be re-evaluated before re-entry. New evaluation is required. Fees apply.